A very central hotel that evokes a little of the trademark top hat and tails and the swirling mists of Queen Victoria's England. The Grosvenor is a luxury 4-star in the capital's Belgravia district that not only looks terrific but is ideal for connections to and from Victoria mainline railway station. Nothing in the 'old smoke' is likely to compare to this one. Retaining most if not all of its original period features the elegant and spacious Grosvenor in the city's bustling Victoria district has 357 bedrooms including 140 executive rooms and two suites and must rank as one of London's finest and most well respected properties. Famous and iconic landmarks such as Buckingham Palace, Kensington Palace, London Zoo, Knightsbridge and The Tower of London are all within easy walking distance and if first class English cuisine is top of your list guests will enjoy dining at the outstanding Brasserie. The Brasserie lounge also offers the delights of a traditional afternoon tea and light refreshments. With 357 well appointed bedrooms, this truly historic hotel offers a fabulous traditional atmosphere with friendly and attentive service. BT Openzone Wi-Fi and air-conditioning is available in all rooms. 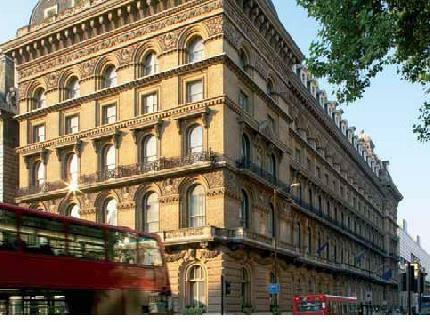 The Grosvenor sits virtually opposite Victoria Station in the lavish Belgravia district, just south of St James Park. The hotel is ideally placed for the City of Westminster, attractions like the Cathedral and shops like House of Fraser.